Fortunately for enthusiasts, most conophytums are easy to grow once you understand and respect their winter-growing nature. There are some which are slightly tricky for various reasons such as C. comptonii, phoeniceum, reconditum, roodiae subsp. roodiae and turrigerum and just a few that are extremely difficult verging on the impossible, namely C. buysianum, depressum subsp. depressum, roodiae subsp. sanguineum, and rugosum. There are a few others such as C. achabense and armianum that present problems as young seedlings but which become fairly easy to grow once they get to about two years of age. Such comments are obviously very subjective and what is a difficult species for some people can be easy for others. However, as a purveyor of young conophytums for many years, I often received “wants lists” and the four taxa that I regard as extremely difficult feature frequentlyon these lists. The only one of the four that I have ever managed to propagate in sufficient numbers to distribute is C. rugosum. Three of the problem taxa share the feature of seeds that can be difficult to germinate and for the fourth there are hardly any seeds available, thus compounding cultivation problems by limiting the amount of material to work with. 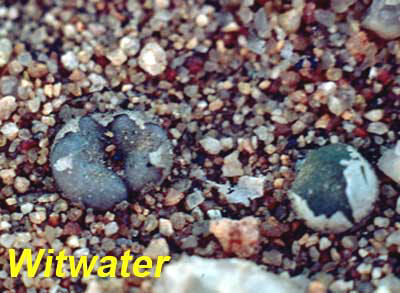 Self-fertility is rare in the genus Conophytum, one normally needs to cross plants of two distinct clones in order to set seed. Therefore can it be a coincidence that both C. depressum subsp. depressum and C. rugosum are self-fertile and produce seeds from their own pollen? I suspect that even in the wild, these two taxa are relatively short-lived and therefore need to ensure that there are ample seeds produced during a short lifetime in order for survival. My only encounter with C. depressum subsp. depressum in the wild was in the Khamiesberge, to the south-east of Leliefontein, an area that can be cold and even snowy during the winter. On our visit in April, there was frost on the car windscreen after we had camped overnight in the area. There is no way that I would have seen the plants without the help of my very good friend Steven Hammer because they are essentially buried in the grit in which they grow, one just has to look out for small signs at ground level. The wild specimens were only one- or two-headed and would therefore fit with the naturally short-lived theory. 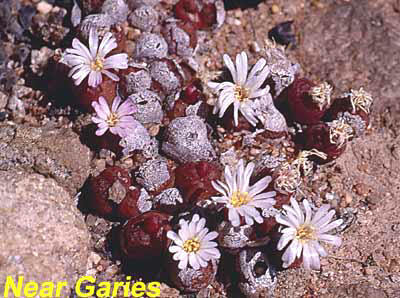 It has been reported to occur over quite a wide area of Namaqualand, but few people have seen the various populations because of the cryptic nature of the plants. Steven had this taxon in cultivation at that time in the late 1980s and provided me with some seed. Unlike most conos, the seed did not germinate well but the ones that did germinate grew on quite quickly and flowered at around two years of age. They subsequently died and I failed to produce a second generation in my greenhouse. I have not grown it since. My experiences essentially mirrored those of Steven who was based in New Mexico at the time and the taxon does seem to be almost a biennial or short-lived perennial, growing for a couple of years, flowering, producing seeds and then dying. On the same field expedition in 1988, we encountered plants of what became the holotype of C. depressum subsp. perdurans when described in “Dumpling and his Wife” in 2001. I found the plants in a grit pan on the farm Rietfontein (south-east of Springbok) where just a seed pod betrayed the presence of a thriving colony buried in the grit. Neighbouring grit pans were barren, so why was one particularly attractive to the subpecies? Steven had also seen it two years earlier on the neighbouring farm Silverfontein. Brought into cultivation, this material has been firmly perennial and built up into clusters to neatly fill a 6cm pot; I still have vegetatively-propagated descendants of the original plants. The orange flowers are larger than those of subsp. depressum and are not self-fertile. Subsp. perdurans obviously got its name from an ability to persist into old age and fits into the tricky rather than the near-impossible category. Like the type subspecies, seeds often do not germinate well, but a stock that I have had recently from a population to the north-east of Rietfontein has behaved much better in this respect and I have been able to distribute seedlings. My other three problem conos are all in the section Cylindrata. Conophytum rugosum is wide-spread through Namaqualand and is much easier to see, such that I have found and photographed a number of colonies as have my various cono-ecotourist friends. It can be found growing on the 500 million year old eroded gneiss domes that are so characteristic of the area along with C. pellucidum and pageae; C. obcordellum subsp. stenandrum and C. minutum can also occur on the same domes in the southern part of its range. The colonies of C. rugosum that I have observed have tended to grow in grit pans near the base of the domes, whereas C. pellucidum and pageae have been higher up. When the winter rains fall, the run-off from the domes can be expected to create a moister environment on the low parts of the domes where they start to flatten out, so I wonder if problems in growing the species are associated with us giving it too little water? There is some variation in the colonies that I have seen, particularly in the colour of the bodies that can vary from green to brown. Flowers are small suggesting that it has given up the idea of attracting pollinators and that it is happy with self-fertilisation. The first problem with C. rugosum is germinating the seed. I have always had a low success rate, maybe 5 – 20%, and germination is very slow, usually taking at least a month. I sow in January with bottom heat that raises the temperature about 5oC above ambient. I do not keep good records, but get the impression that germination is best when January is cold and bright. This results in my seed unit having a wide diurnal variation from about 8oC at night to over 20oC in the day and I suspect that this wide fluctuation is beneficial. Seedlings usually grow on quite well for the first couple of years but then seem to run into problems and start dying or at least some heads in a clump die or fail to expand when watered in the autumn. This is a problem that also occurs with various forms of C. roodiae and C. buysianum which are also in the section Cylindrata. The best solution to perpetuating these taxa seems to be to regularly pull the heads apart and replant in new compost. This is easier than it sounds because C. rugosum, C. buysianum and most forms of C. roodiae are mat-formers and each head independently forms roots as the mat grows. So they can be easily pulled apart into separate heads that already have roots. C. reconditum grows in the same way but does not seem to suffer from the same die-back problem, it simply succumbs to sunburn if not given some shade in the summer. I have maintained some stocks of C. rugosum for quite a long time but they eventually seem to disappear unless repropagated from seed. 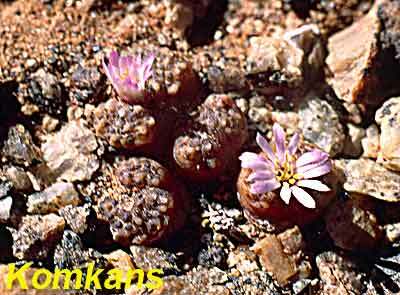 Conophytum roodiae is also widespread on the Namaqualand eroded gneiss formations and in common with most widespread plant species, it shows much variation. It is the large-flowered, self-sterile sister of C. rugosum. Most ecotypes of the species are quite growable although they do suffer from the same problem as C. rugosum in that some heads fail to resurrect in the autumn and that frequent separation of heads is needed. However, in the south-west corner of its distribution, to the south of Garies, there is a very special population that when it was first discovered was known as the “red pea”. These grow in grit pockets in gneiss rock that is barely raised above the level of the surrounding vegetation and as the same suggests they have quite rich-red bodies when they first emerge in the autumn in the wild. This element was given the name C. roodiae subsp. sanguineum in recognition of its bloody colouration, but in cultivation in the UK the red colour is usually not so well developed. A few kilometres to the east, near Hoedberg, there are more populations of well-pigmented C. roodiae but these are brown-purple rather than red and with a more rugose epidermis. I would personally include these in subsp. sanguineum rather than subsp. roodiae but I suspect that other authors would not. Steven Hammer provided me with seeds of the “red pea” around the time he described it in 1990 but I found them very difficult to germinate. Adult plants are even more prone than the typical subspecies to die-back during the resting period and I eventually lost them. In the mid-noughties, I got more seed from Steve and this germinated fairly well and I have been able to maintain some plants and even produce a few seedlings from them. I think that there has been unnatural selection at the Sphaeroid Institute in that propagating plants by seed in cultivation over several generations has produced a strain that has self-selected for easier cultivation. So I am now optimistic that this attractive plant will become more common in our collections in the future. 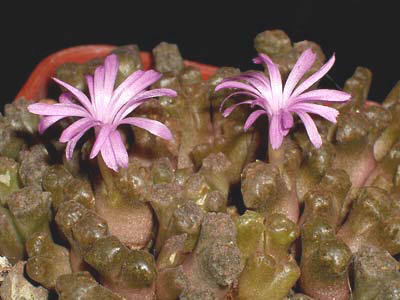 Conophytum buysianum was regarded as a purple-flowered subspecies of C. reconditum in “Dumpling and his Wife”, but was given full species status in Bradleya 2011 and at the same time, a smooth-bodied variant was published as C. buysianum ssp. politum. I have never seen this species in the wild although Jennifer and I once spent an afternoon unsuccessfully searching gneiss hills to the west of Kliprand using habitat info that Steven Hammer had given us. Those were pre-GPS days, but even if co-ordinates had been available we might not have found it; Chris Rodgerson has told me that it is extremely cryptic when not in flower. The species was first discovered by Buys Wiese, a nurseryman and conservationist from Vanrhynsdorp, and named for him. C. reconditum is little problem to grow apart from ensuring that it does not get sunburnt in summer, but C. buysianum in contrast is a real beast. The first problem in growing this species is getting any material either as plants or seeds. I suspect that seeds have never been offered commercially and very few are even available by exchange between friends. I was given about 10 seeds of subsp. politum some time ago and did raise three plants to flowering size that I subsequently lost. Steven Hammer regards subsp. politum as rather easier to grow than subsp. buysianum but I think that his British friends find both to be equally intractable. I did achieve some success with a couple of heads of ssp. buysianum that I was given. These were grown on to a group of around 50 heads that filled a 5cm square pot and which flowered for several years. During the summer I kept the pot in a position where it did not receive any direct sun and I think that this is probably essential for the species. In the wild it probably retracts under the grit for the summer. The first assault on this pot was by a tortrix moth which decided to lay its eggs on one of the most valuable plants available to it. Fortunately this was spotted quickly before much damage was done, but sometime later heads started to die off for no apparent reason and now I am back to a couple of heads which is more or less where I started. Modified from original article published in the "Bulletin of the Mesemb Study Group".